Global biofuels market is anticipated to grow to $132.67 billion by 2023. It is expected to be mainly driven by environmental impact, increasing population coupled with increase in energy demand, and climatic concerns which will act as key drivers for the growth of this market. Increasing population across the globe has led to an increase in the demand for energy. This has directly resulted into increased consumption of fossil fuels such as coal and petroleum which are expected to deplete by 2060. It is estimated that every year the world consumes approximately 10 billion tonnes of oil in fossil fuels. Owing to this, there is an increase in demand for sustainable solutions such as biofuels and other alternative sources of energy. Moreover, dependency on fossil fuels for energy generation has led to an increase in greenhouse gases volumes, which has a direct impact on public health as these gases pollute air leading to global warming. In addition to that, gases produced from wastes are the major factor for many hazardous diseases to rise which can result into mass epidemic. 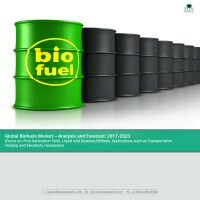 The report titled “Global Biofuels Market” provides an in-depth analysis of the key development strategies and market trend dynamics which includes drivers, challenges, and opportunities prevailing in the biofuels industry. Key regulatory bodies have also been considered in the report because of the compliance requirements with environmental regulations and promotion for the production of biofuels. Moreover, value chain analysis, consortiums, and patents have also been included in the report. Key development strategies adopted by biofuel producers, distributors, and service providers have also been included in the report. The biofuels market estimation has been built on detailed assumptions. The market has been estimated on the basis of different types of biofuels produced, their applications, and geography analysis. The report profiles 25 organizations on the basis of manufacturers and services providers working across the biofuels industry and in different geographies. • What are the key drivers, challenges and opportunities for the global biofuels market? • What kind of development strategies have gained traction among the players for growth in biofuels market? • What are the different types of biofuels produced across the globe, their application types and their market sizes? • Which region is currently dominating the global biofuels market and the market size by different geography? 6.16.10 Energy Visions Japan Co. Ltd. Global biofuels market for first generation biofuels is an established billion dollar industry. Factors such as depleting fossil fuels and increasing energy demand, policy mandates and climate change mitigation among others are key indicators driving the growth of the market. It is anticipated that population will grow in the Asia Pacific and African regions at a faster rate coupled with rapid urbanization. Currently, urban population accounts for 54% in 2015 globally which is expected to reach approximately 58% in 2025. This single fact clearly indicates that that there will be an increase in the energy demand, which will eventually drive the demand for biofuels. Liquid biofuels accounted for a major market share in comparison to other biofuel forms in terms of value. It accounted for 73% share in total biofuel market in 2016. Liquid biofuels and solid biofuels are expected to witness high growth in developing nations in the future as increase in GDP and population of the nations will promote industrialization, leading to surge in energy demand. Transportation application held a major share in terms of market value in 2016 among all the mentioned application types. In the coming future, heating application is expected to be the fastest growing application among all the other applications owing to its increased use expected in developing and non-developed economies, and cost effectiveness, among others. Europe dominated the global biofuels market in 2016 and accounted for 36.18% of the global biofuels market. Furthermore, Asia Pacific is expected to be the fastest growing region for biofuels market due to rise in population in the APAC region, which is expected to increase the demand for energy in this region. Moreover, it comprises of more than half of the total developing economies such as China and India present globally, which are responsible for producing large volumes of greenhouse gases.